A Japanese dish prepared with rice, fish, seaweed and vegetables. The filling can be raw, cooked or marinated. Sushi is normally understood to be raw fish and is also used to refer to other Japanese food, such as maki, nigiri and sashimi. Eating raw fish is becoming more and more popular: besides sushi, carpaccio and raw fish entrees are now a regular item on the menus of many Italian restaurants. At first sight it looks like a good idea, because raw fish maintains intact all its precious omega 3 content and keeps its nutritional qualities. Eating raw fish is good for your health because it is an important source of omega fatty acids and trace elements, especially iron, phosphorus and iodine. However, there are unwanted guests in raw fish that could cause parasitic disease: the most dangerous of these is anisakis. This parasite is transmitted to humans by eating raw fish and is particularly hardy. Only prolonged cooking (at least 10 minutes) or deep freezing can eliminate it. Symptoms include nausea and vomiting and often involve violent abdominal pains. The eye of the fish must be convex and protruding, not flat or recessed; the scales and skin must shine and never be covered in mucous; the gills must be bright red; pay attention also to the smell, which is the first sign of badly preserved fish. Every week batches of fish infested with the parasite are withdrawn from the market: recently 120 anisakis alarms were launched in Europe. Marinating does not kill parasites, fish should be cooked for 10 minutes at a temperature of at least 60°C. This nematode is a white larva, 1-2 cm long, highly dangerous for our health because it migrates from the fish entrails to its meat if it is not quickly gutted after capture. It is mainly found in anchovies, sardines, mackerel, and herrings, but also in tuna, salmon, cod, mullet, seabass and swordfish, as well as squid, hake and angler fish. At the least, once swallowed the larva will die or not induce symptoms; however it could also settle on the wall of the gastrointestinal system, from the stomach to the colon, causing an acute or chronic parasitic disease which sets in a few hours after eating raw fish. Anisakis is also acknowledged as a possible cause of allergies that involve rashes, asthma, angioedema, rhinitis, conjunctivitis and anaphylactic shock. It is commonly treated by surgery to remove the part of the stomach or intestine to which the parasites have attached. Before enjoying raw fish, it must be held at – 20°C for at least 24 hours, i.e. deep frozen. Unfortunately, freezing in a conventional freezer compromises its texture, flavour and vitamin content. The ideal solution is to use a shock freezer that freezes rapidly to regulations but does not ""damage"" the quality of the fish. Blast chillers lower the temperature of food up to twenty times more quickly than a traditional freezer. With reduced freezing time the water in the food is transformed into microcrystals which do not alter the texture, as does a conventional freezer that transforms the water into macrocrystals. You can see the difference when you thaw: shock frozen fish preserves its texture perfectly, together with consistency, colour and flavour. 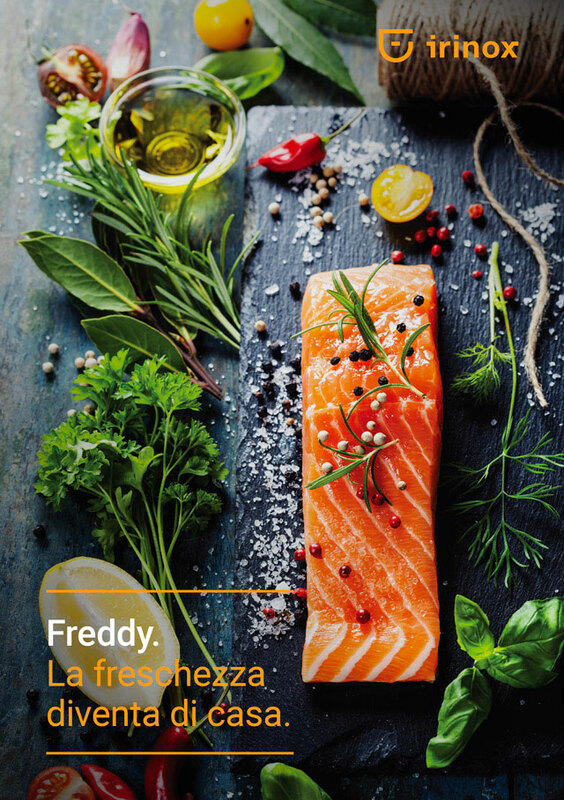 Shock freezing with any product of the Irinox range completely eliminates the anisakis hazard, maintaining the flavour and consistency of the fish intact: it is practically impossible to distinguish shock frozen food from fresh food.